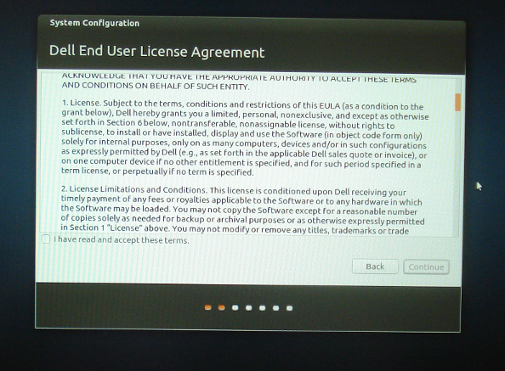 What's the difference between vanilla Ubuntu and the Dell OEM version? What is the difference between the official (generic/vanilla) Ubuntu and the one which ships with the Dell Precision 5520? Does the latter contain any non-free software, for example? apparently dell iso image is not really UEFI compatible, the dell windows tool creates a boot partition for UEFI. it's shameful but it is what it is. dell iso image contains dell-recovery package plus under /installs folder contains the drivers for your laptop, they also contain or set up /etc/apt/sources.d/ with dell apt repo to update packages. last change is that the executable they run in the ram image is installation script and do not alive "live image" mode where you can play around with it, most chances because they do some setups, the installation is "hands free" but what's not is the regular ubuntu installation and what is is dell setting up drivers and defs for u like the nvidia-intel combo video card driver. if u have the .iso image, the original one for precision 5520 i'de love to have that. Not the answer you're looking for? Browse other questions tagged dell oem or ask your own question. What version of Ubuntu 11.10 should I prefer? 64bit or 32bit? How do I fix UI lag on a Dell Precision 5520 when using a Bluetooth keyboard and mouse? How to install bios updates in Zesty (on a Dell laptop)? What's the difference between Ubuntu 16.04 and 16.10? Is Dell pre-installed Ubuntu the same as the general release? Should I install firmware update from the Ubuntu Software Center?